Cranworth Gardens was built during the most prolific and decorative house building period in British history. As well as giving birth to the suburb, the end of the Victorian period into the Edwardian period saw a huge boom in inner city building. South London saw street after street pop up from Camberwell to Clapham, Crystal Palace to Herne Hill. Thanks to the census and electoral rolls it is quite easy to find out about the past tenants of Cranworth Gardens. It is not quite this easy to find out about Robert H Matthew, the architect who designed the sturdy flats that form this handsome street. It is impossible to know his objectives but there are many clues both on the outside and within the flats that can be observed today to give us an idea of what his plan comprised of. This section covers the main architectural and design features of the street. When first built the street would have looked very uniform. 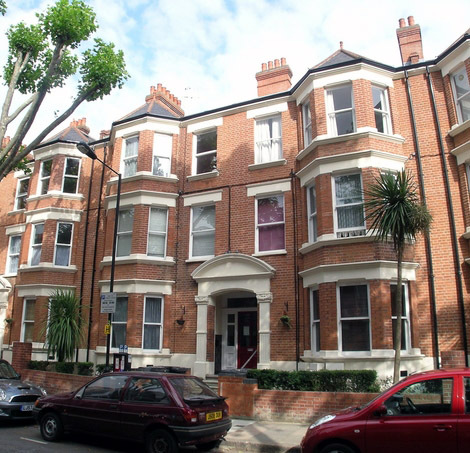 Each adjoining block is built with distinctive red brick and off-white plasterwork around the windows and doors. However, since it was first built the look of the street has been altered in several ways, the most obvious is highlighted in the two images below. There are several properties, mainly to the north end of the street that have been fully plastered and painted in a creamy white colour. 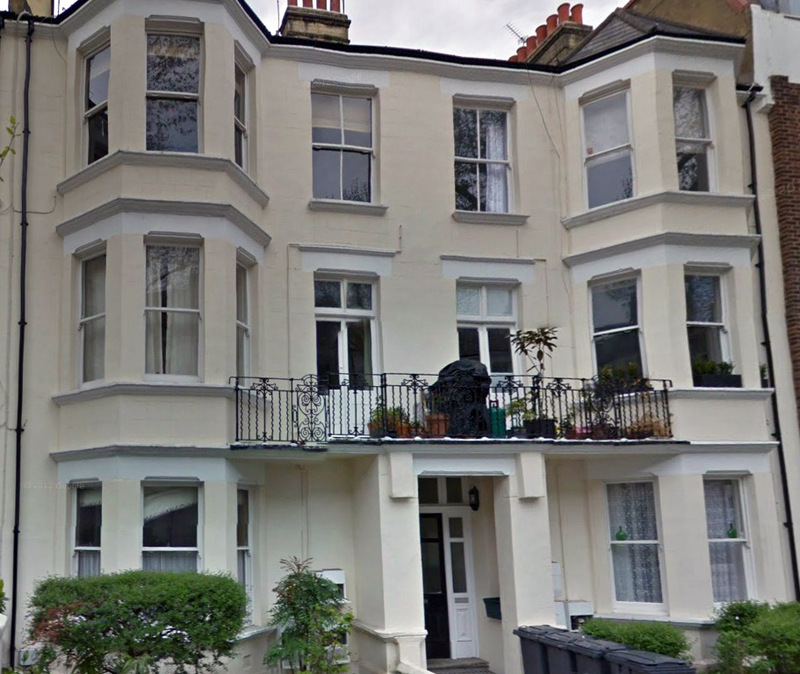 Some have even had the middle windows converted into tiny balconies with iron railings. 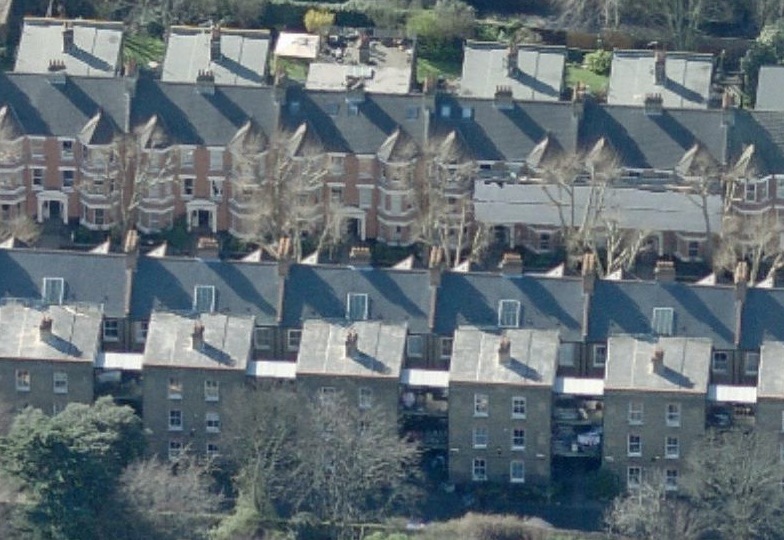 The plain red brick frontage of Cranworth Gardens is typical of mansion-block style and can be seen all around london. 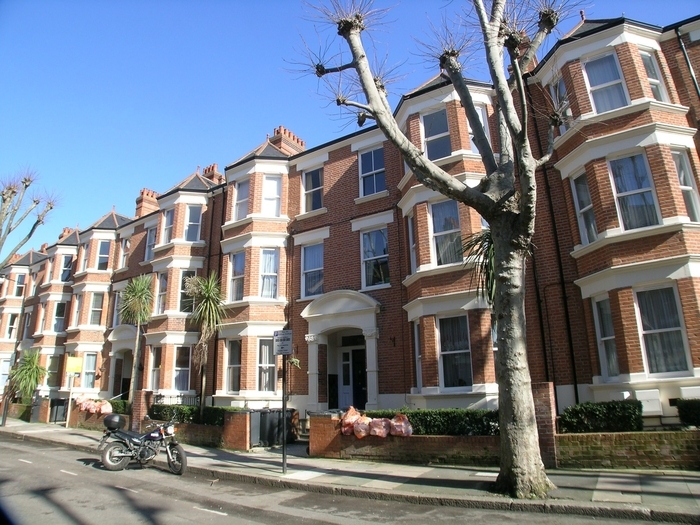 The style was originally derived from the French as until the late Victorian period the English had no tradition of apartment blocks for the middle classes. The relatively plain and sturdy look to the buildings was intended to give a sense of reassurance at a time when apartment living was very new and not always trusted by those accustomed to living in houses, often with their own servants. Times and fortunes had changed and Cranworth Gardens offered a new type of affordable abode for working professionals, the mansion flat. The large bay windows were designed to let in as much light as possible, this made sense as Cranworth Gardens was not built with electricity installed and therefore did not have electric lighting. Each flat was built with gas lighting installed which was nowhere near as bright (or as clean) as electric light. The small walls that front each block were once uniform and from looking closely at the 1908 photograph from part one of this feature it appears that there were small hedges growing alongside these walls. The areas which once contained the hedges have now been mostly paved over throughout the street although a few do still have plants and bushes. The walls in front of many of the blocks have been rebuilt and altered with time and with war damage. 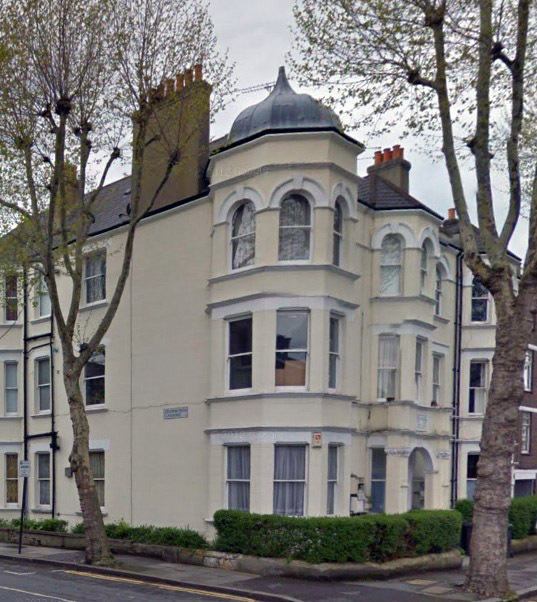 The north end of the street was clearly designed to impress, with large lead cupolas on the roofs of both properties that run alongside Southey Road, creating a grand entrance to the street. You can see this in the photograph below. It was typical of the Edwardian’s to concentrate the most decorative touches to the doorway of a house and Cranworth Gardens is no exception. Originally each block had a tiled floor area leading up to the front door, some have been destroyed and concreted over. Many remain however, see the photograph of block 97 to 102 below. The large plaster surround is identical around all doorways on the street (those that haven’t been altered that is) and features fluting on the lower parts and two upper sections with basic leaf mouldings. The original doors remain intact in most blocks, as with the picture above. The door is surrounded with a large wooden frame with dark coloured stained glass. There was originally, a plate of glass indicating the block number above each door. This was before the buildings were renumbered in 1948. The panels have been removed and replaced with plain glass in all but one block. 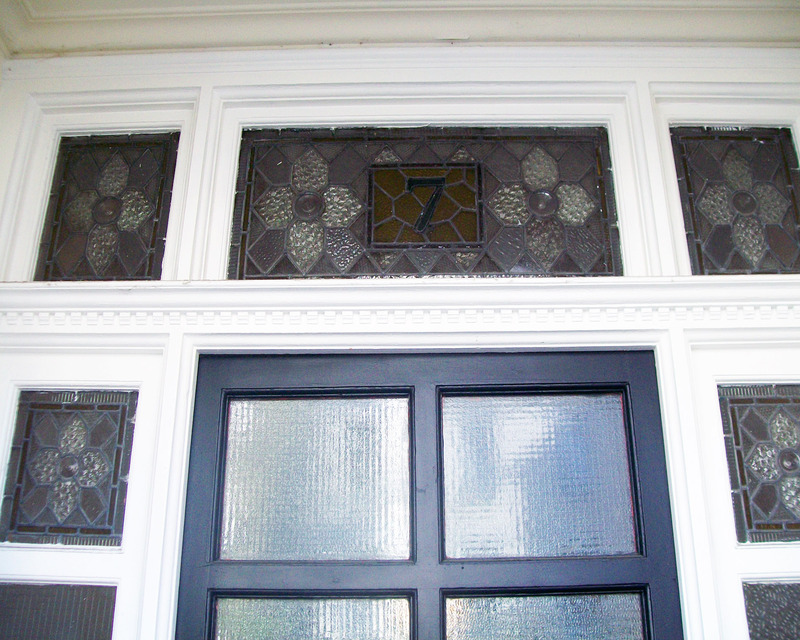 At 19 to 24 the original panel remains and shows the original number of the building, number 7 – see photograph below. There are thick glazed tiles at either side of the doorway area which run part way up the wall in each block. 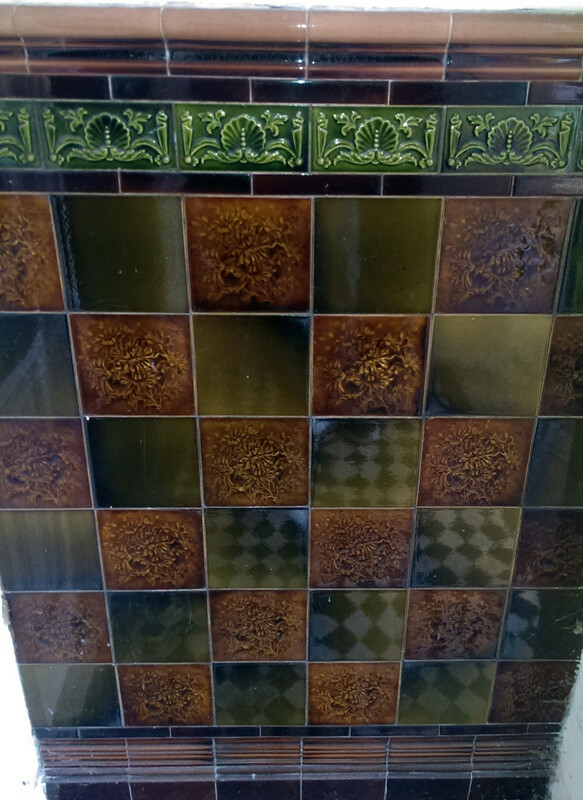 The style of the tiles differs from building to building. In the photograph below from number 19-24 the tiles show wild flowers, leaves and scrolls, all very standard motifs of the time. 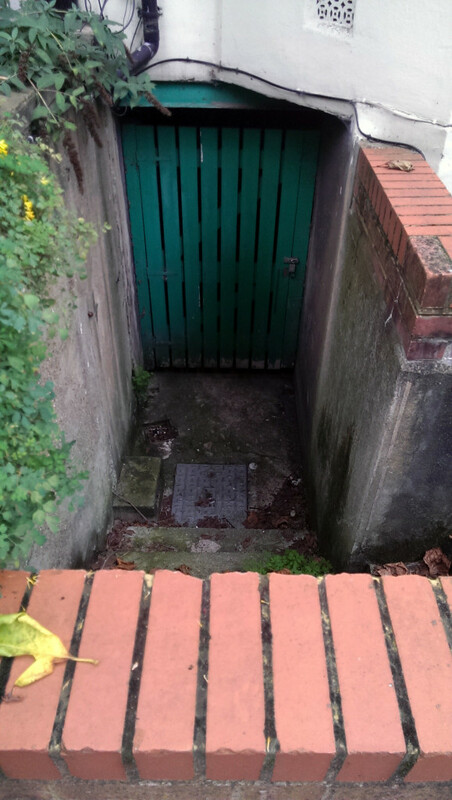 Throughout the street there are gated walkways that lead under the flats through a tunnel to the back gardens. The walkways are important as they allow those living in the flats that are not on the ground floor to have access to the garden. This was particularly important in the era of coal fires as this is where the coal sheds were. The walkways and the steps that lead down to them appear to be dotted throughout the street, they are not a feature of every block and appear to be interspersed quite randomly. 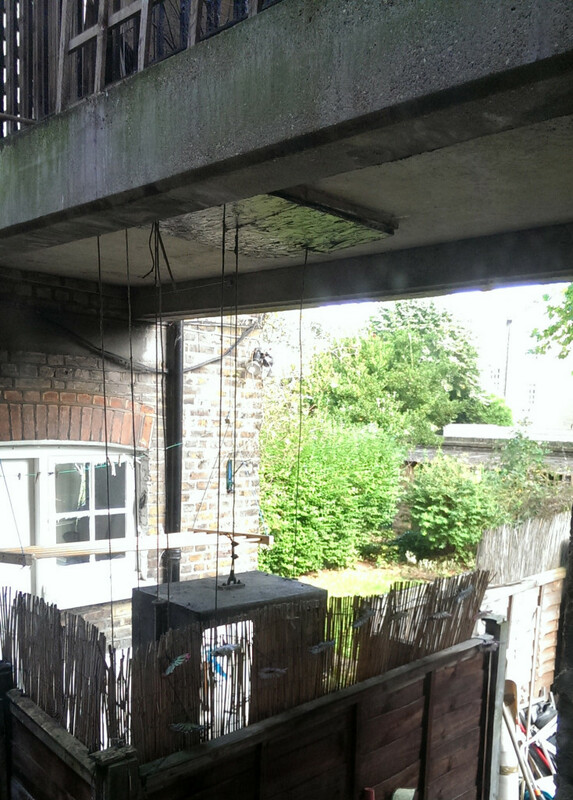 There is a right of way though the passage for more than just the tenants of the property that it runs under, for example the walkway under 19 to 24 can be used by any tenant from number 1 to 24 to access the gardens. You can see one of the walkways in the photograph below. As with the front of the street, the setup round the back of the flats was simple and uniform when first built. Each block on both sides of the street had it own small garden with coal bunkers built against the back wall. The bunkers have been removed along much of the street, some remain however as you can see at the very back of the photograph below. 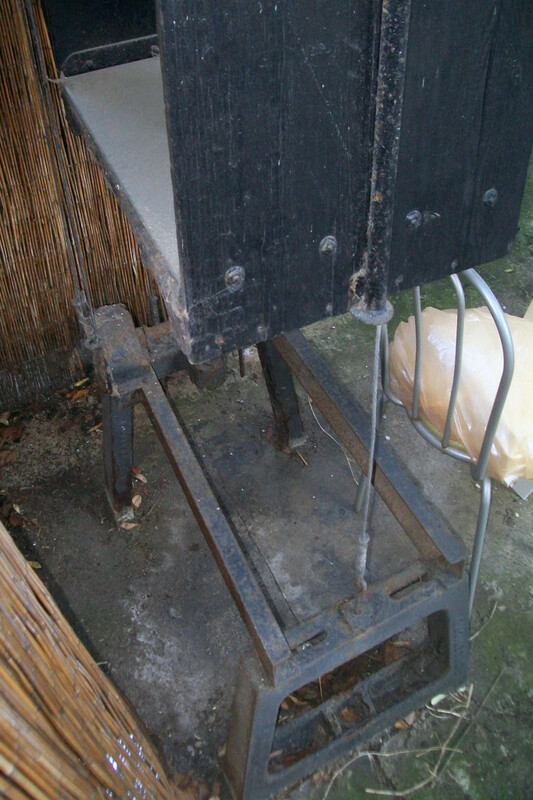 Coal was of course essential when Cranworth Gardens was first built as it was the principle fuel for fires and stoves. The architects knew this and installed an ingenious balcony and pulley system at the back of each block which meant that tenants of the upper level flats could go to their coal shed in the garden, load up coal onto a wooden platform and then by turning a handle the coal platform would be winched up through a hole in each balcony so that it could be reached by tenants in the middle of top level floors. In the photograph below you can see the steel cables that support the coal platform. The gap in the balcony above has now been blocked up enabling those using the balcony to have a safer, more spacious area. If it wasn’t for this winch system those living on the top floors would have had to have carried coal all the way from the coal sheds in the garden, through the underpassage and then up onto the street, then up the stairs in their block and through their flat. A messy and tiring task. In the photograph below you can see a rare intact coal platform including the iron foot that anchored it into the ground. It’s rather remarkable to think that this platform has survived given how much use it no doubt once had. The gardens that are behind both sides of the street have been drastically altered. On the east side of the street only numbers 1 to 24 have the original separate gardens with coal sheds. The rest of the gardens on the east side were all merged into one long concrete strip for car parking when the Peabody housing association bought flats 25 to 75 in the 1970’s. 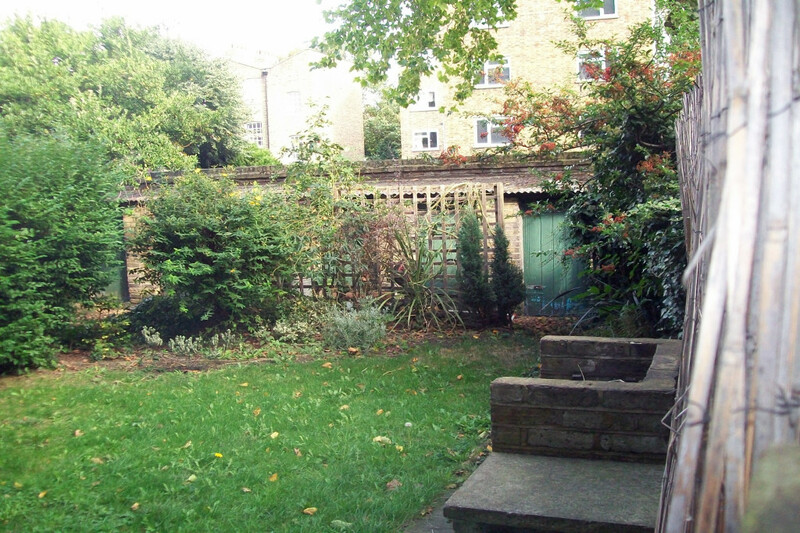 On the west side of the street all separate gardens were merged into one long grassy open space for all residents to share, see the photograph below. 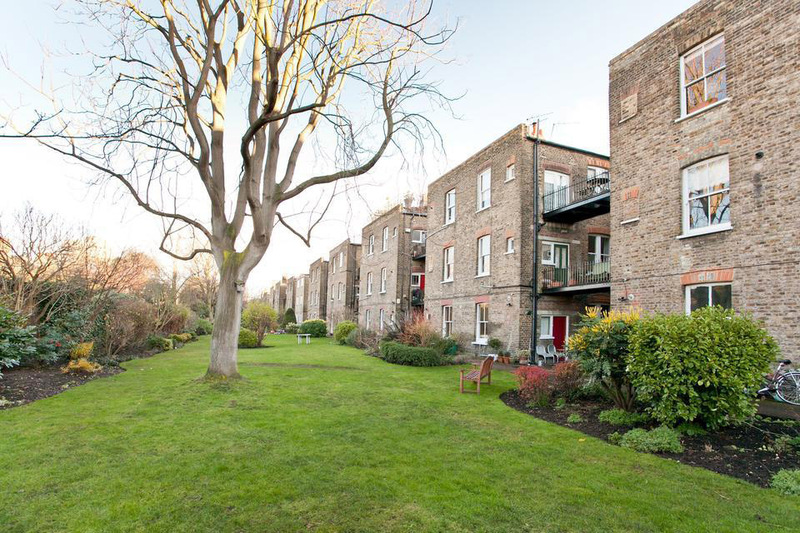 You can see by looking at the back of the blocks in the picture that many of the small windows at the edge of the buildings have been bricked up, this is because these windows originally looked into utility rooms that have now been converted to other uses. The final detail that I’m going to point out concerning the exterior of Cranworth Gardens requires us to look down from above. At the top of each property, towards the back part of the roof is a large skylight, this allows light to beam down into the hallways which when originally lit by gaslight, must have been quite gloomy. See the aerial photograph below. 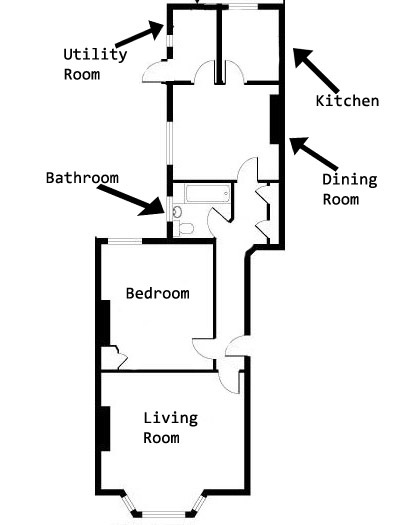 The upstairs layout is a little different. 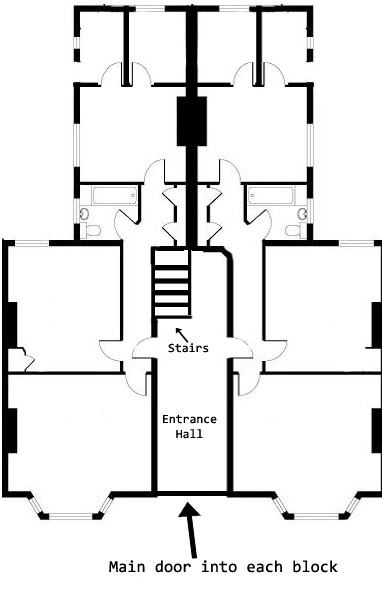 In the plan below I have taken a cross section of one block, showing how two flats sit next to each other on the middle and upper floors of Cranworth Gardens. Each entrance hall offers a spacious entrance to the block with very high skirting boards and stained glass. 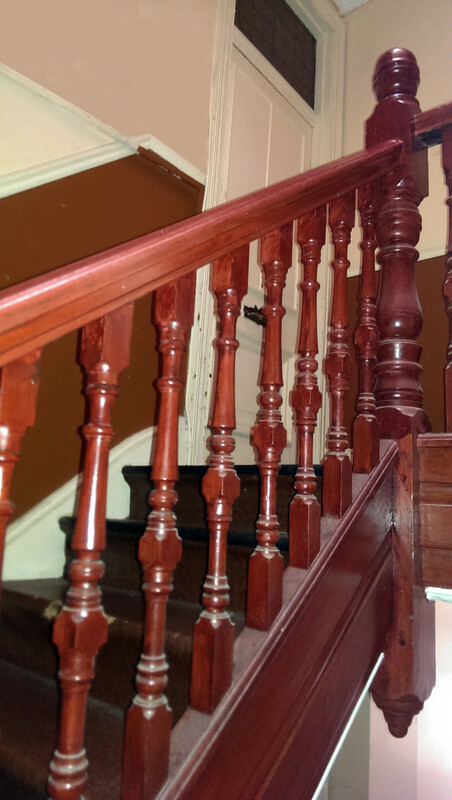 The original carved wooden staircase remains in almost all blocks, see the photograph below. 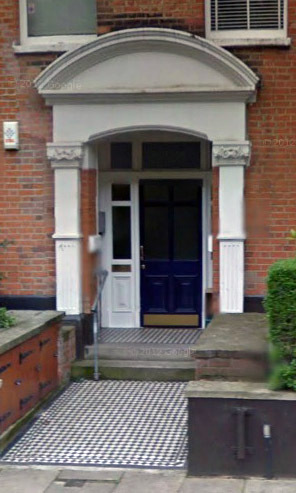 The original doors into each flat are also commonplace on Cranworth Gardens, the glass has often been replaced or boarded up entirely as in the photograph above. 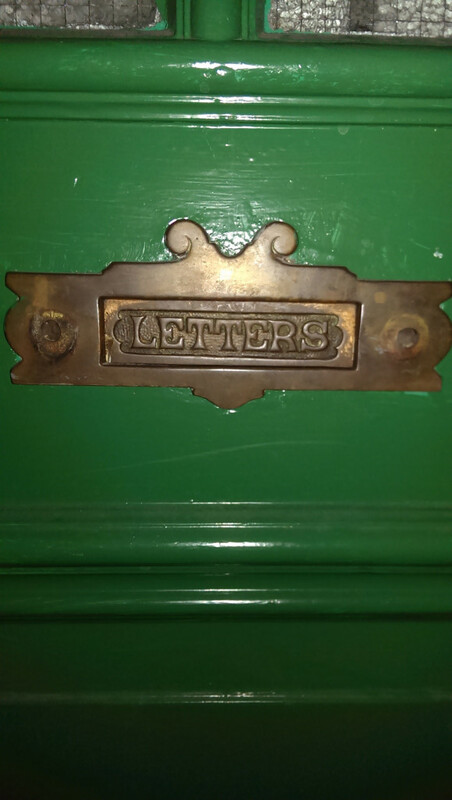 They each have an ornate letterbox that harks back to a time when the postman delivered to each individual flat. Times have definitely changed! Cranworth Gardens was built with space in mind, particularly in the living room and main bedrooms. 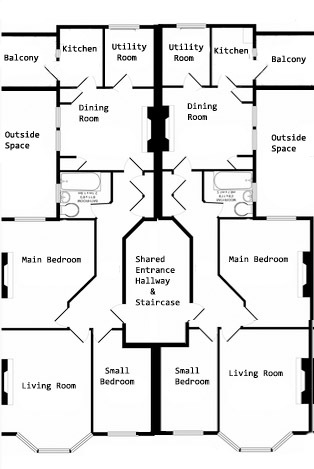 Throughout each flat there are ten foot (3 metre) high ceilings, this was to create a greater sense of space, not to mention to create a wider divide between neighbours. After all let’s not forget that around the time of Cranworth Gardens being built most of the British were unaccustomed to apartment living and the idea of living cheek by jowl with another family was considered somewhat unappealing. 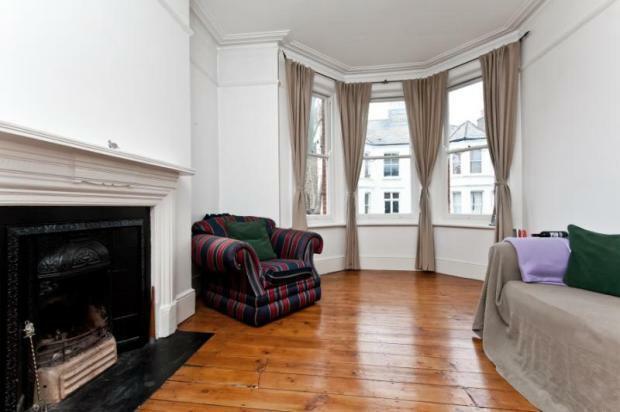 In the above photograph you can see a typical upstairs living room on Cranworth Gardens complete with original fireplace and flooring. It is likely that the flooring, given the period, would have mostly been bare treated floorboards, with large rugs to add cosiness. Many flats on the street still retain their original fireplaces. There was a fireplace in the living room, main bedroom and dining room in all properties. 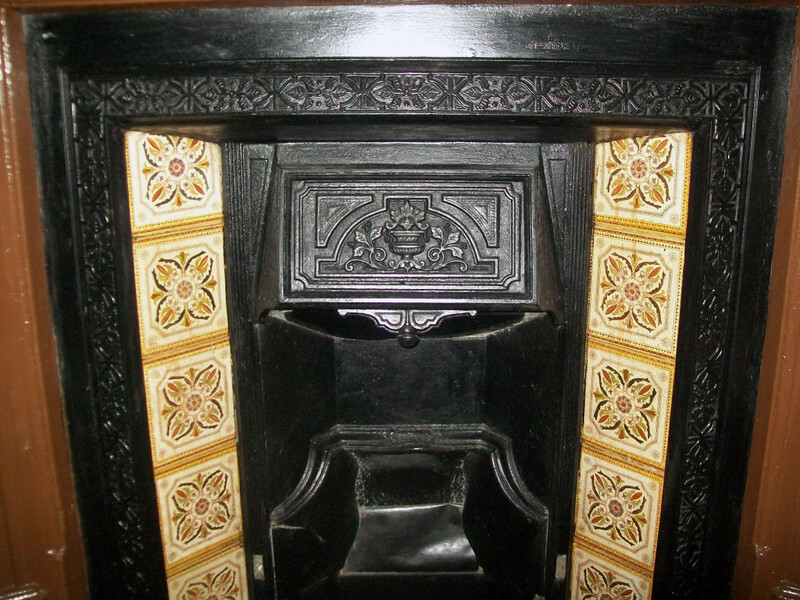 These fireplaces were mostly cast iron and many flats had the exact same surround. In the photograph below you can see the cast iron surround from a living room on Cranworth Gardens complete with glazed decorative tiling. The heating would certainly have come from the fireplace however it seems that upon completion Cranworth Gardens was fitted with gas lighting and not electricity. This is evident by many rooms on the street still containing a small pipe sticking out of the wall, mostly above the fireplace. This pipe would have had a gas lamp attached to it, providing what was then a very commonplace source of light. Even now in some hallways and cupboards the original gas pipes that powered the lighting still remain and are painted over, serving no purpose. It is not clear when electricity was introduced to the street, often it depended the owner of the building having it installed.